The latest semantic spin is to call the looming $1.2 trillion in cuts, which could throw the whole economy back into recession, “Obama’s Sequester.” House Speaker John Boehner indulged this approach half a dozen times in a floor speech before he went on break, establishing its place in the talking-points firmament. There are a couple problems with this tactic, as my colleague Michael Tomasky pointed out Tuesday. Congress passed sequestration before the president signed it, and the whole self-defeating exercise was carried out in response to Tea Party Republicans’ insistence that we play chicken with the debt ceiling, which ultimately cost America its AAA credit rating. It’s essentially an internal sales document from the old dealmaker Boehner to his unruly and often unreasonable Tea Party cohort. But it’s clear as day in the presentation that “sequestration” was considered a cudgel to guarantee a reduction in federal spending—the conservatives’ necessary condition for not having America default on its obligations. 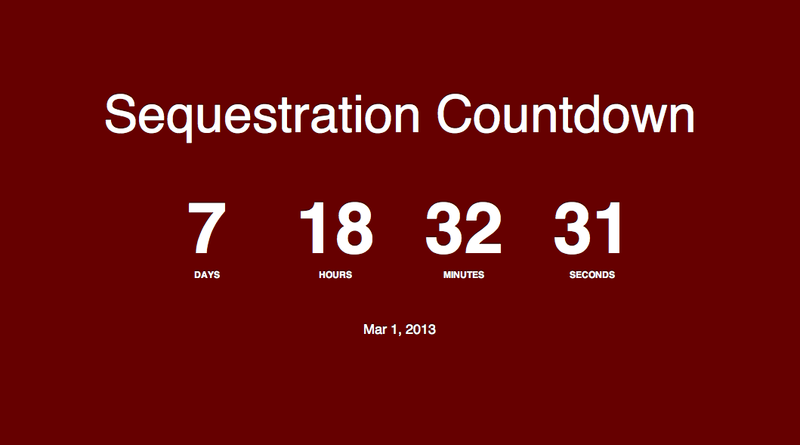 And that’s pretty much exactly what’s scheduled to start happening on March 1. Democrats could just as easily spin this as “Boehner’s Sequester” or “Cantor’s Sequester” and offer indelible digital evidence to back up their claim. Boehner’s office contests that characterization, arguing that the PowerPoint was simply Boehner’s attempt to explain the president’s plan to the Republican caucus. “This slide simply shows a description of the Budget Control Act after President Obama insisted on including his sequester,” says Boehner spokesman Michael Steel. The supercommittee failed in large part because the Republican representatives couldn’t agree on revenue increases from closing tax loopholes. After the presidential election, the two parties couldn’t reason together to avoid the next self-imposed hurdle, the fiscal cliff, and instead passed a last-second patchwork that dealt with the tax rates that were scheduled to rise but left the sequester unaddressed because there was no time to hammer out a grand bargain. And so here we are again, days away from a new deadline, and a sensible grand bargain to deal with our long-term debt seems very far away. All of the bipartisan plans that have been compiled—Bowles-Simpson, Gang of 6, Rivlin-Domenici—follow the same basic balanced formula of targeted spending cuts, entitlement reforms, and revenue increases from closing tax loopholes. Everyone is going to have to give a little to pass a balanced plan in a divided government. The Obama-Boehner grand bargain that was negotiated in the summer of 2011 and came so close to being agreed upon increasingly looks like the best bet conservatives could get. But they pressured Boehner to walk away without so much as a returned phone call. Today we see some of the same hyperpartisan fantasies dominating the debate, the idea that waiting just one more election will allow one party to impose its will and avoid any concessions that could anger the base. So Republicans say the problem is only spending—but then in the next breath decry the deep defense cuts that are scheduled to make up half the sequester and pass a bill that would simply exempt their given interests from pain. Liberal Democrats attack the Bowles-Simpson commission, which offered new details on Tuesday as an alternative to sequestration, as a capitulation to Republican priorities and imagine they will retake the House in 2014. Like a junkie begging for just one more fix before they get straight, these politicos keep begging for one more election before they face facts. Math isn’t partisan. Our current levels of debt are unsustainable. They can’t be solved by simply cutting or taxing our way out of the hole. The hypocrisy runs deep. While a bipartisan plan like Bowles-Simpson gets paid plenty of lip service, when it came to a vote in the House, it went down to defeat, 382-38, with just 22 Democrats and 16 Republicans voting for it. President Obama also deserves blame for not backing Bowles-Simpson when it was first proposed or aggressively pushing a lame duck grand bargain. And while the GOP has often responded to his outreach with the back of its hand, the president must rise above and lead. Obama’s call to pass a short-term $110 billion stopgap measure is better than the alternative meat-cleaver cuts, provided that it lays the groundwork for a real grand bargain. The sequester was designed to be so stupid and painful that it would compel the supercommittee—or a lame-duck Congress—to come up with a reasonable alternative. But it was apparently not painful enough to compel the two parties to work together, despite the shared goal of some $4 trillion in debt reduction. And now, faced with the pain that both parties voted for but nobody wants, they’re busy pointing fingers and trying to assign political blame. Congress should come back from vacation and get back to work. There is no more time to waste. Washington is now the greatest impediment to America’s hard-won economic recovery—a situation that’s equally pathetic and predictable. 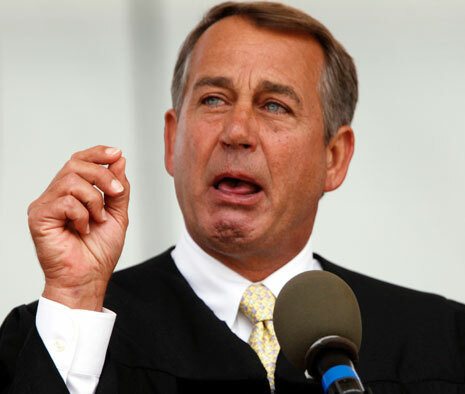 Here is how John Boehner reacted when his PowerPoint Presentation was discovered! Poor baby…. ← Response Songs #4 – A Blinding Insight?